Kids' furniture is often overlooked when it comes to selling and staging your home. Staging kids’ rooms can be a big challenge, especially if they are small in size. But home buyers with families focus on these rooms; in fact, some buy homes based on the children’s rooms. If your goal is to attract buyers with your irresistible kids’ rooms, you have to make the most of what you have. Maximize the available space to make the rooms look more spacious and appealing. Use space-saving kids furniture to create rooms that are totally unique. Here are a few ideas. Contemporary kids bedroom furniture comes in every style and design. There are sofas that turn into beds, beds that turn into tables, and tables that turn into consoles. Functional, space-saving furniture is the in thing and it’s here to stay. As homes become smaller and smaller, homeowners are looking for ways to create more space. Choose pieces that can easily change their function and save valuable space in your child's room. You can buy pieces that help children to play with shapes and experiment with space. Or you can get those that can be easily dismantled for storage. Pieces that are easy to dismantle can be stored prior to showings. When buyers arrive, all they will see is the open space. When it comes to small bedrooms, function is more important than style. Space-saving bedroom furniture not only improves your quality of living, it consumes little space. If your kids have traditional beds, sell them or donate them. Get bunk beds kids can share or buy beds with storage underneath. Your kids can store clothes or toys in the storage space and keep their rooms neat. Bunk beds save a lot of space and are perfect for small bedrooms. Those with stairs add to the functionality of a room and make it more interesting. Murphy beds are also ideal for kids’ rooms. The ultimate space savers, they get more fashionable every year. They free up space and create more play room for kids. No other room in a home needs built-ins more than a kids’ bedroom. Built-in closets, study desks, and cabinets help get rid of the clutter normally found in kids’ rooms. You can install built-in shelves above the bed to create storage for favorite items. A built-in desk with drawers adds functionality. You can install a desk with drawers and connect it to the closet. If the room can’t hold a lot of furniture, install a bench to ensure kids have a place to play. Side tables or nightstands can take up a lot of space in the bedroom but are essential. Nightstands are useful features because they hold glasses of water and storybooks, but also help anchor the bed visually. 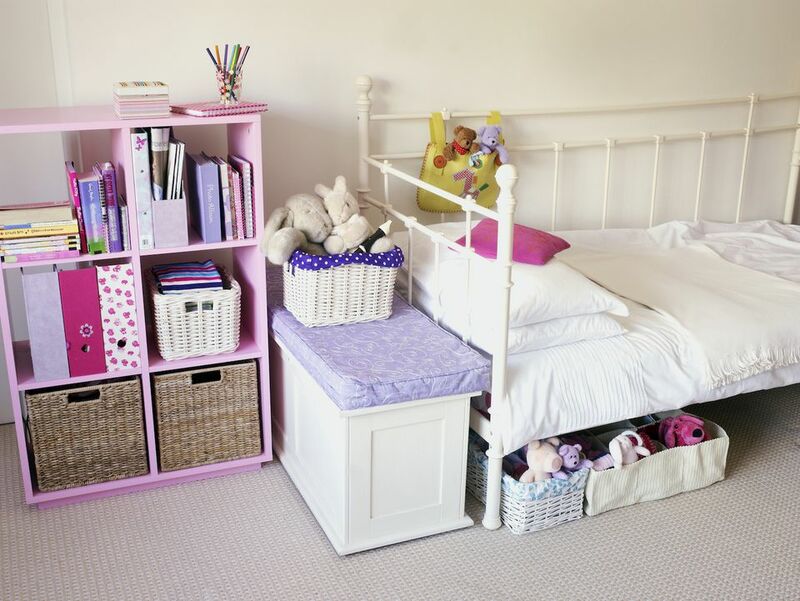 Consider using smaller side tables if your kids' bedroom has too much furniture and looks small to potential buyers. There are several types of nightstands, from wall-mounted types that look like they are floating to integrated nightstands in modern headboards. Create a coordinated aesthetic in the room with nightstands that coordinate with the bed and the style of the room. When staging a kid’s room, steer clear of dull hues. Children like bright colors and chances are that potential buyers will love your bright kids’ rooms. Choose furnishings in bright colors that draw eyes to themselves. But ensure they match the other features in the room. If you are not willing to spend money on new furniture, paint or update the current pieces. Unleash your creativity and you’ll be sure to wow buyers. Organizing kids’ rooms can be difficult, but it doesn’t have to be dreadful. The rooms are usually filled with toys, clothes, and other gadgets that can quickly create a mess. Don’t let buyers see your kids’ rooms at their worst, use contemporary kids furniture to make them shine. Buyers with kids may bring them along for a showing and if your child’s room is staged to impress, it could help you get a good offer.